Hurray Glossier now ships to Canada! Most of you couponing-types won't care or know what this is but for us beauty lovers this is a big deal! I've been waiting to be able to buy Glossier products for what seems like a year or so, and had no access to it until now! The brand was started by "Into The Gloss" beauty blogger Emily Weiss with the perspective to make the best makeup products, that you'll reach for everyday, simple and uncomplicated. Their approach is to wear the makeup, not to let the makeup wear you. Some of their most popular products are the three products pictured in the image above, their Milky jelly cleanser, Priming moisturizer and Balm dotcom as well as their Boy Brow. Best of all you can get Free Shipping if you buy 2 things on their website. To ship to Canada, make sure you change your shipping to Canada (change the country at the footer of the website on the homepage). I missed this step at first! All prices will be in Canadian currency. 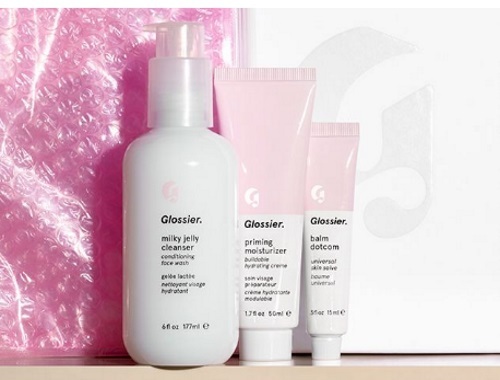 Click here to browse Glossier.